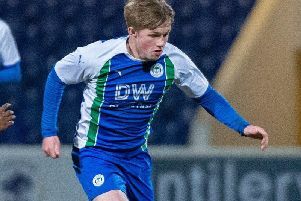 Wigan Athletic Under-18s will take on the role of the underdogs when they face Category One academy side Liverpool in the fifth-round of the FA Youth Cup later tonight. Latics - who are currently unbeaten in all competitions this season- are hoping to continue their exceptional run of form at Chester FC against Liverpool in the 7pm kick-off. Gregor Rioch’s side are the league leaders of the EFL Youth Alliance, as well as reaching the area final of the EFL Youth Alliance Cup and the final of the Lanchashire FA Youth Cup. Latics thumped Category Two side Hull City 6-2 at the KCOM stadium last month to book their place in tonight’s clash. England youth international Joe Gelhardt scored a hat-trick, while Charlie Jolley (2) and Divin Baningime- the brother of Wigan Athletic first-team loanee Beni- were also on target. Having netted on 12 occasions in their last three cup games in all competitions, Latics boast a truly menacing threat going forward. The defence is equally as impressive as their attack, with Wigan only conceding two goals in those three aforementioned matches. Despite their 25-match unbeaten run in the 2018-19 campaign, Wigan still find themselves as the underdogs in the tie. Sitting at two categories higher than Wigan in the Elite Player Performance Plan (EPPP) academy system, Liverpool are the overwhelming-favourites to advance into the next stage of the FA Youth Cup. The EPPP academy system is based around an independent audit process where clubs are assessed and given a status of one to four, with one being the highest ranking. The club’s youth-set ups are assessed on the following key areas: productivity rates, training facilities, coaching, education and welfare provisioners. Category One academies- like Liverpool FC- will have a high contact time with young players, require a minimum of 18 full-time members of staff and a whopping operational budget of £2.5 million. Managed by former Wigan Athletic Centre of Excellence coach Barry Lewtas, Liverpool will also enter the clash in fine form. They have recorded three victories from their last five games in all competitions, and also clinched a one-all draw against begrudged rivals Manchester United in their last outing. Latics U18s coach Peter Murphy is looking forward to seeing his young guns challenge themselves. “Liverpool are a Category One side, it will be a test for us, but it will be good to see how we come up against it. With both sides brimming with confidence, spectators are set to be treated to an explosive encounter at Chester FC’s Deva Stadium. The game will unfortunately clash with Latics’ first-team fixture against Stoke City at the DW Stadium, but the venue selection and fixture date was the only available date for the home club.